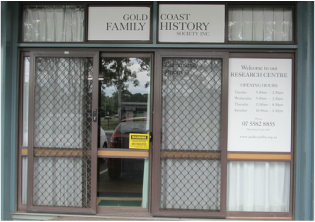 Visiting Us - Gold Coast Family History Society Inc.
Lockers are provided for the secure storage of personal articles. A range of other facilities are also provided for the comfort and convenience of researchers. ​or come by bus - buses stop at the door. As a member there is a small fee of 0.50c each time you come to the rooms. Day Research is available for non member at a cost of $10.00 this cost is deducted from your joining fee if you join on the same day.